The history of the study of vocal music at the university dates back to choir courses taught at the Ongaku Torishirabegakari (Music Investigation Committee). In 1900, during the years of the Tokyo Music School, a Vocal Music Department was established to train vocal specialists. Inheriting this tradition, the Department of Vocal Music seeks to train vocalists capable of meeting the demands placed on artists today. The educational philosophy of the Faculty of Music calls for instruction in the basic techniques and knowledge required for vocalists – seeking not just to train vocalists who are technically outstanding, but who demonstrate a deep humanistic outlook and profound knowledge. Seeking to train graduates capable of making broad contributions to society through their impassioned performances, the voice program encourages students to perfect their musical skills while deepening their awareness of the world and their understanding of the role of music within society. The Faculty aims to nurture not just vocalists who are technically outstanding but who demonstrate a deep humanistic outlook and profound knowledge. The goal is to nurture individuals who can contribute widely to society through their impassioned performances and who have a deep awareness of the world and the importance of the role of music in society. Master: Following the undergraduate education, the area of specialization is further determined (opera or solo) and more specialized research is conducted including practical performance experience in individual specialized fields. The solo singing program comprises the Master’s recital in the second semester of the first year and the performance for receiving the degree in the final year. The opera program includes three public performances with opera highlights in the first year, regular opera performances in the second year and the performance for receiving the degree in the final year. Doctor: Individuals who have obtained the Master’s degree can further expand their specialized research. This includes enriching one’s repertoire in the specialized area and in relevant practical performance techniques, broadening one’s knowledge of foreign languages required for writing the dissertation such as studying research papers in original language, and aim to write a doctoral dissertation that is guided by research analysis derived from one’s own performance experience as a musician. In the solo program, the performance exam consists of a doctoral recital each in the first and second year and the performance for receiving the degree in the final year. In the opera program, the performance exam consists of the doctoral recital (opera performance) each in the first year and second year and the performance for receiving the degree in the final year. Faculty: The Bachelor’s degree is awarded once the abovementioned curriculum policy is fulfilled and the final year graduation performance has been thoroughly assessed. Master: The Master’s degree is awarded once the Thesis Review Committee comprising a supervisor of the concerned research field and teaching staff of related fields reviews the performance and the thesis, and the abovementioned Master’s curriculum policy has been evaluated as fulfilled. Doctor: The doctoral degree is awarded once the Thesis Review Committee comprising a supervisor of the concerned research field and teaching staff of related fields reviews the performance and the dissertation, and the abovementioned doctoral curriculum policy has been evaluated as fulfilled. The program accepts up to 54 undergraduate students and 20 master’s-degree graduate students each year. The doctoral program accepts two or three students each year. Lessons in practical vocal skills are led by 11 full-time and 14 part-time faculty. In addition, 28 part-time instructors and performance associates take part in classes and lessons offered by the Department of Vocal Music. Three educational research assistants provide support for student studies by handling department operations and administering sheet-music materials. Based on one-on-one lessons in singing, a major foundation of the curriculum is choral practice (from the first through the third years of the undergraduate program), intended to improve student vocal technique and musical expression while honing ensemble skills. Required subjects include fundamentals of harmonics, solfege, and playing in instrumental music (including a general course in piano). While basic of opera and opera works are also deemed important topics for vocalists, these subjects are not required, out of consideration for students majoring in solo performance. Students interested in choral performance and ensemble (chamber chorus) performance also enroll in vocal ensemble classes. In addition, students study two or more foreign languages, which are of special importance to vocalists. From the master’s degree program, students split into solo singing (song, oratorio) and opera majors based on specific characteristics of each student’s voice. Undergraduates study both programs to help them grasp the specific characteristics of their own voice. In contrast to undergraduate studies, in the master’s and doctoral programs students choose from solo singing or opera vocal study. The solo singing major focuses on the study of song and oratorio; the opera major focuses on performing specific opera roles. The master’s degree program is generally completed in two years, and up to 20 students are accepted into the program. For the purposes of the entrance exam, prospective students are not separated by solo singing and opera majors. Instead, students select their concentration after passing the exam. Through one-on-one lessons by faculty specializing in practical vocal techniques, students pursue a specialized course of study consistent with their own major. In the special study in Vocal Music courses taken by students in both majors, students are free to select from a wide range of choices, including songs in Japanese, German, Italian, French, and English, as well as religious music, ensemble music, and operatic ensemble music (for solo singing majors). Many students take virtually all of the special studies courses. Intended primarily for opera majors, classes in opera works and opera works (Repertory) provide students with the practical experience they will need as professional opera singers. At the end of the program, students are assessed based on a thesis and performance, with passing students receiving master’s degrees. In the doctoral program, students with master’s degrees pursue advanced independent studies, generally completing the program in three years. The path to the doctoral degree is narrow, with only two or three students accepted each year in the solo and opera majors collectively. As in the master’s program, students progress by expanding their repertoires, guided by faculty advisers who provide specific guidance in practical vocal techniques. At the same time, students enhance their knowledge of foreign languages in preparation for thesis work – for example, studying works in the original language. The goal is to prepare a doctoral thesis based on research and analysis suited to performers, guided by their own performance experience. Students passing the final exam, which consists of both performance and a thesis, are awarded doctoral degrees in music. Most students of the program are performers active beyond the university, testifying to the high capabilities of students in this program. The university has concluded sister-school arrangements with numerous overseas universities and often engages in international exchange at both the student and faculty levels. 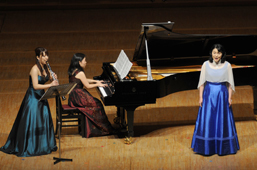 Events include joint recitals between faculty in the university’s Department of Vocal Music and those at the Central Conservatory of Music in Beijing, China, with recitals alternating between the institutions each year. Solid ties have been established between students at the university and South Korea’s National Music Academy through joint recitals. The university has exchanged students with Austria’s University of Music and Performing Arts in Vienna to perform Mozart’s opera “Così fan tutte,” a joint opera performance which students found particularly inspiring. In addition, the master’s program in the Department of Vocal Music accepts outstanding overseas students, offering entrance exams for these students each year. Many international students come from China and South Korea, and the program has also accepted students from Venezuela. Many graduates of the undergraduate program in the Department of Vocal Music take educational courses to acquire teaching credentials. These graduates often work as educators at institutions, including middle and high schools. Some 10% of graduates advance to graduate school for further study. Many of those completing the graduate school programs are active vocalists or opera singers in Japan and around the world – evidence of the very high level of study at the university.